John plays guitar, banjo, mandolin, autoharp and bass while Heidi plays autoharp, piano, hammered and mountain dulcimers. Heidi also teaches autoharp, hammered and mountain dulcimer, and is a regular contributor to the Autoharp Quarterly and the Dulcimer Players News. 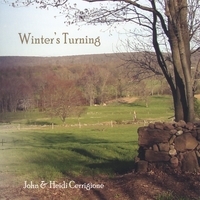 Released in 2006, “Winter’s Turning” is John & Heidi's 2nd duet recording. A relaxing selection of family favorites and songs they wanted to share. Selections include 10 instrumentals and 10 vocals featuring mountain and hammered dulcimer, autoharp and guitar. What sweet music and singing. I just loved your CD! Enjoying this CD very much, also. Very pretty harmony, soft and relaxing. We are enjoying the songs and music so much. The harmony is wonderful.They sing a lot of songs that we know. I'd intended to write a review of this album over a year ago, when I first bought it, but was prevented by a medical mishap, and long recovery, but now I can--There aren't kind words enough to describe how joyful, hopeful, and loving John and Heidi's music is, and how it has uplifted and inspired me. This album was my introduction to them, but I intend to buy all eventually. I'm sorry your ratings go up to to 5 stars--it deserves a 10! Thank you!!!! I hope there will be many more.